In this Pearl Roadshow review, I will outline where the value lies in this particular set, and also how to make the most of your drum kit over time. This 5-piece drum kit series comes with basically everything you need to start drumming as soon as the package hits your doorstep. With proper tuning and tweaking, you can make this kit to sound just perfectly for your needs. Can only an experienced drummer make those tweaks? And why should you even care to make them? This fragmented state of a drum kit can be a little intimidating. 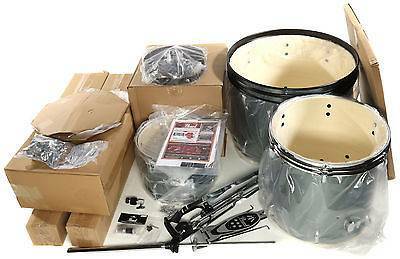 You might be scratching your head, wondering how in the world you’ll get this drum kit and all its parts put together. But not to worry: simply check out the short tutorial below. It’ll give you step-by-step instructions on how to assemble the Pearl Roadshow. 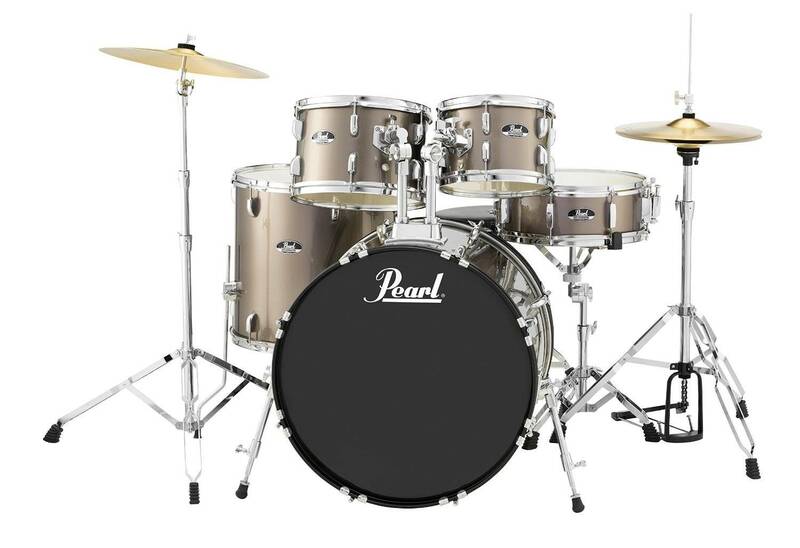 The Pearl Roadshow 5-piece drum kit features 9-ply poplar shells with a covered wrap finish. 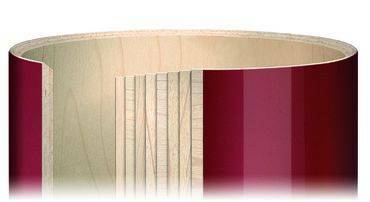 Poplar is the standard wood used for drums in that price range. “Is that good or bad?” you might ask. Well, poplar is robust and will last you for a good few years. And in terms of sound it does have different characteristics than, say, a maple kit (which would also cost you about $700 more). But I find that those sound differences are very subtle and hardly noticeable for a beginner or even intermediate drummer. So my recommendation is: go with poplar, it’s good enough for any beginner drummer’s needs – and instead focus on getting your tuning right (I’ll show you how in a second). The Roadshow also comes with a Pearl 500-series hi hat, snare, and cymbal stand, as well as a Pearl series bass drum pedal and cymbals. As a complement to the hardware, they also included a drum throne and durable stick bag. The hardware and accessories this kit comes with make it an easy purchase for someone who’s not that familiar with drum set-ups or doesn’t have enough drum-knowledge to buy everything separately for a custom kit. The budget price tag makes it all the more appealing! The Roadshow hardware consists of two cymbal stands, one snare stand and a hi-hat stand. All of this provided hardware will have no trouble supporting the included cymbals and snare drum. For general hobbyists and beginners, they will find that the quality of hardware is good enough. However, for more experienced drummers, such as jazz musicians who need a more stable hi-hat and ride stand (because they go crazy fast on these things and play them all the time) – for them upgrading to something that can tolerate more wear and tear might be in order. A nice feature to top the package of is the drum throne that’s included with the Pearl Roadshow. 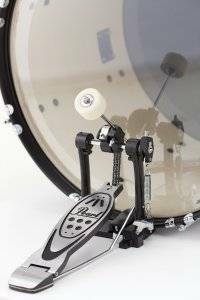 Pearl has provided a dual chained single beater kick drum pedal. This pedal is standard, with no bottom plate. It can cater to a wide range of drumming genres. A beginner or student drummer who won’t hit the drum with too much force will benefit the most from this pedal. New drummers will find that this pedal gives them exactly what they need. With proper care, tuning, and dampening techniques, your snare, kick and toms will sound pretty solid for a very long time. As I’ve said above, drum shells made of 9-ply poplar are considered “basic” but, again, don’t let this label fool you. These shells can give you the sound you want no matter what genre you play. If you want an idea of the kind of potential the Pearl Roadshow has, check out this video demonstrating upgraded and properly tuned drum heads. This drummer has also added a maple ring around the bass drum to produce more open undertones, as well as a dampened kick drum head. Obviously, the Pearl Roadshow offers lots of bells and whistles that aim to provide a platform and give you all the tools you need to play the drums, but if you’re a seasoned drummer this might not quite be enough for you any more. The snare drum is more than capable to give you a very dynamic range and consistent sound when properly kept. However, if not maintained, it can produce an overtone which is not something you want. This can easily be avoided by routinely tuning your shells, snare, and kick, as well as properly dampening your kit (this way you’d also practice tuning which in my opinion is a crucial skill for any drummer. After all your beats can fully on time, but if you play them on a bland snare or bass drum – hardly anybody will care to listen). The cymbals and hardware are a different story. The cymbals do provide the basic feel expected from cymbals, but they do not produce the dynamic range or posses the quality material to give a drummer what they might need in the future. Naturally, when you buy entry-level cymbals, you won’t get the best quality hardware provided with them. The cymbals and hardware included in this kit are designed to give someone the bare essentials. And this is the case with all other beginner drum sets (for they all come with stock cymbals – or without any cymbals whatsoever). These drums can be easily modified and done so in a way that will make it sound like a studio kit. 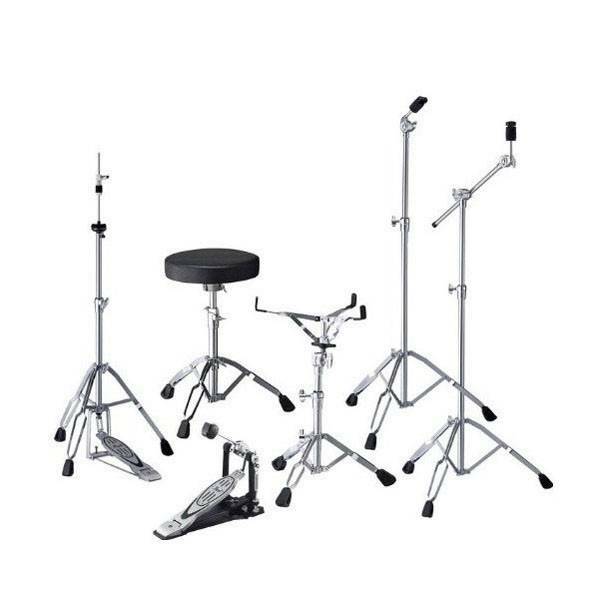 This is a kit that can provide a drummer with what he or she needs. Keep in mind that this the Pearl Roadshow includes standard quality cymbals, 500-series hi-hat/cymbal stands, tom mounts, and a Pearl series bass drum pedal. For someone who wants to go the extra mile and really upgrade the Pearl Roadshow to its maximum potential, I say go for it. With suspended tom mounting, maple bass drum ring, and good heads (bass drum muffler) plus proper tuning/dampening, this kit will sound incredible! Overall, this kit can accommodate any genre or skill level, all it takes is a little initiative and drum kit care/maintenance. The shells, for what they are made of, provide a really warm sound when adjusted. The included shell pack that the Pearl Roadshow offers does outweigh the downsides that the shells or hardware have. If you are a beginner, the Pearl Roadshow will do a very good job for you for the first years of drumming! For somebody who already has an existing bass drum pedal, cymbals, and hardware, you’d be wasting your money on gear you don’t need. You can look for standard shell packs like the one here. From a sound standpoint, the natural tendency of this kit is to have some slight overtones. This can be very frustrating for a new drummer who doesn’t have the ear or knowledge to compensate for sound imbalances yet. But as I said, it’s also a good motivation to learn tuning right from the start. Finally, an advanced drummer may find that the cymbals aren’t very dynamic or responsive enough. I’d say they are enough to start drumming, but as you gain more experience you’ll eventually require an upgrade in cymbals. Yet, getting new cymbals doesn’t need to cost you a fortune. This kit can be for any drummer who plays any genre. This is because the Pearl Roadshow is available in different configurations, and I’ll tell you a little bit more about each option (Fusion, Jazz, New Fusion, and Rock). 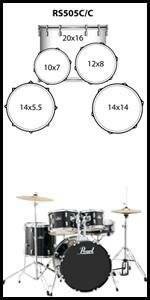 The Pearl Roadshow “Fusion” kit option houses a slightly smaller bass drum at 20 x 16, as well as slightly smaller toms at 10 x 7 and 12 x 8. This configuration is meant to give alternative rock drummers a softer sounding rock’n’roll sound. 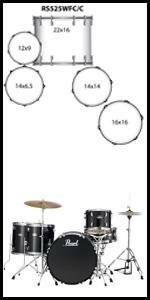 The “Jazz” configuration offers the smallest bass drum, tom, and snare sizes to provide that high and crisp jazz sound. It does not include a second tom because jazz music usually consists of fast triplets to the first tom and floor tom. The “New Fusion” kit offers a loud rock ‘n roll sound with a 22 x 16 bass drum and a 16 x 16 floor tom, but can also provide subtle soft tones to play modern pop with the 10 x 8 tom. The “Rock” configuration is my favorite. 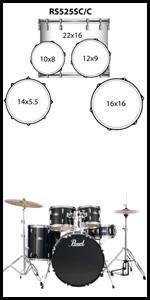 It offers two large floor toms at 14 x 14 and 16 x 16. This kit is designed to produce heavy hitting tones consistent with metal and hard rock. Will the cymbals and hardware last and respond as I improve? They will last for sure. But as I’ve explained above (The Cons), the cymbals aren’t too responsive and there sound not all too nuanced. Enough for practicing at first, but you should get new ones once you get on stage. Will the shells sound good? How can I know? These shells are all 9 ply poplar. Untuned poplar tends to have very inconsistent tones around the drums because the poplar is so light, however once tuned properly, it distributes the tone evenly and will produce a toned and bright sound. And tuning isn’t hard to learn. See the video above on how to dampen and tune your drums. Since the kit is made of light poplar, will I have any physical issues with the kit? There is always a potential to run into product defects. I always recommend buying a warranty in case anything should happen. …and I recommend you’d look at the Pearl Export in particular. 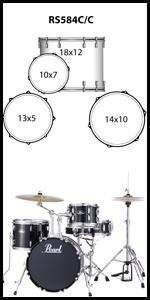 This is serious kit for an advanced drummer. The mahogany shells will provide a very dense and constructed tone which is a blast to play and listen. Along with great shells, the Pearl Export comes with suspended opti lock toms that allow them to move a little more organically when being played. Pearl also gave the Export kit some well needed hardware upgrades for intermediate to advanced drummers. For more details, check out my Pearl Export review. So, if you’re willing to spend more, the Pearl Export might be able to accompany you for a decade into your drumming career. If you have the Roadshow, you might want to upgrade to the Export eventually. On a budget, though, the Pearl Roadshow is a quality product for anyone just starting out with drums. Among everything included in this kit, the hardware and cymbals really stood out, not really in a good way though. They aren’t “worth it” in terms of longevity and studio-level performance – but they will provide you with what you need right out of the box. Again, I’d like to make it clear that these cymbals aren’t meant to grow with a drummer over time as they are simply meant to give a drummer the feel and sound of cymbals at an entry-level price. I do think that the hardware is a little more dependable than the cymbals, but I also don’t think it will last you 10 years down the road. It will definitely provide you stability and support for lighter cymbals and lighter snare drums – but you’ll eventually want to upgrade. On the upside, however, I think the Pearl Roadshow can accommodate anyone who is willing to tune that kit well once when setting it up. In order to do that, you’re going to have to learn how to tune properly, but this isn’t rocket science and you could do with only the video I’ve inlcuded above. Once you do those two things, you’ll be set and will have a crisp sounding kit with no overtones. With everything mentioned above, there’s a lot to say about the quality of the drum set. It really is impressive for it to be able adapt to modifications at such a low price. The shells are definitely the biggest appeal as they can deliver such a warm and pure sound. I recommend the Pearl Roadshow to any beginning drummer! Still Undecided or Disagreeing With My Verdict? Then let me hear from you in the comments. I reply to each and every comment! Thank you for the time you have put into all of your drumming pages! My almost 16 year old is wanting to get started and it has been so helpful. My one question for you is for the Pearl Roadshow what would you recommend between the Fusion and the New Fusion set ups? And why? Thank you for your help! Fusion or New Fusion depends on the kind of music your son wants to play. Those sets differ in that they have differently-sized toms, with the Fusion having 10”, 12”, 14” and the New Fusion 10”, 12”, 16”, meaning you’ll get more depth out of fills on the New Fusion than the Fusion. More depth is usually better for rock / harder music, while less depth would be better for Jazz, Swing, Funk etc. But in the end, this comes down to personal preference and will make only a very slight differnce. Thanks for this useful information. I have ordered a new fusion kit for my 8 year old kid. Can you please suggest some nice drum mutes as we stay in an apartment. Cool thing. I hope (and am certain) your kid will like the drum set! These drum mutes are my personal favorites. I used to play the drums frequently for about 5-6 years but I have had about a 4 year break. Do you think the Pearl Roadshow kit would be a good kit for me to start back up again? Thanks for your question and cool that you’re getting into drumming again! Well…you obviously have read my review of the Pearl Roadshow, and if you’ve found nothing in it that turned you away from it, I think it is a good fit. It’s a very good kit for practicing and you can go on stage with this no problem. If you were looking to recod with a kit, I’d recommend you check out the Pearl Export, but from what you say I gather that this won’t be your focus for the time being. In that case, I see nothing that speaks against the Pearl Roadshow – and you know from the article that I think it’s a fine kit indeed! Looking at the road show vs export. We have a set of vintage Zildjians dating back to the 1950’s that are in great shape, just need a bit of cleaning and polishing. Given I already have these, leaning toward the export for the better hardware and shells. Any precautions I need to take with the Vintage cymbals? You mean precautions with respect to the kit fitting the cymbals and vice versa? I think the Export goes together with older Zildjians very well. I’ve played older K Customs (1980s?!) with it and very much liked the overall sound. Or do you mean what precautions to take with vintage cymbals overall? Then this is a good video (series). Yannick i read your review and recommendations with much interest. Do you gave a website ot personal page that I can follow to learn more when I have more time. I played a little drum as a teenager, but now getting old and got this renewed interest. I dont know if I should be buying an old used Export, or a no brand one, or even new. I like to keep the budget down. A used export with Sabian xs cymbals was asking about 350Us is this decent or too dear? Thanks Jenni! And great you’re looking to get back into drumming. Well, you are at my website and you can learn about most of the popular drum sets on the market through the navigation bar at the top. From what you say, I’d recommend you start with this comaprison of acoustic (beginner) drum kits. As for the price: there are a million diffferent models of the Export. Can you tell me the year it was build or even better send a link. Otherwise it’s quite impossible to say if this is a good deal or not. Thanks Yannick for your reply. I understand it might be a model from the 1990s? It was bought as a new old stock by the previous owner, it sounded well tuned and condition is actually very good with little flaws to the hardware, and the kit has Remo skins from two years ago. The snare is steel shell. Sounds like a solid deal to me. Although, if you’re not dead set on the Export, it might be worth comparing it to the Pearl Roadshow for reasons of customer service, warranty etc. (although that’s usually not an issue with acoustic drum kits). But, again, generally, this sounds very solid. Hi. I like the information provided here being I have absolutely no knowledge about drums. My 10 year old started a garage band class and has a knack for drums. I wanted to get him a good starter set without breaking the bank. He is LEFT handed. Does that need to be considered in the purchase. Thanks. Thanks. The Roadshow is as good for a left-handed drummer as it is for a right-handed one. You only would have to set up the kit the other way. Although: I’ve seen many left-handed people start on a the default layout just fine. It makes things much easier down the road when it comes to gigs and to sharing a drum set with another band’s drummer on stage, in teaching other etc. etc. But that’s for your son to test out. The Roadshow would serve him well whichever way he prefers to set it up. This is incredibly helpful. My 10year old just started lessons and is asking for either a cell phone or a drum set for Christmas. Needless to say, the choice is clear- Santa will be bringing a Pearl Roadshow for him. Thank you! Haha, Santa has made the right choice there! Thanks for sharing this, Claire! And wishing your son lots of fun with the kit! My 11 year old son is very interested in wanting to learn the drums. He’s only had 2 informal lessons and our pastor was so impressed with him already, he was asked to fill in during church on Christmas Eve. Everyone was very impressed with him and couldn’t believe he’s not been playing long or had formal lessons. Now we’re looking to get him a kit for at home and are considering the roadshow. What is the approximate foot print of the kit once set up and with four younger siblings who will no doubt want to play, too, is this a good set that would last us many years? We don’t plan to transport it, just for our basement for the 11 year old to learn and the younger ones to tinker as they want & get older. That sounds like talent – very cool! The footprint of the kit depends on the setup you buy (jazz, for example, being smaller than the fusion setup), but it shouldn’t exceed 4 x 5.5 ft. I absolutely think that the Roadshow can serve you for many years. It’s a kit that a beginner can grow with. Hope this is enough of an answer as these basically are assertions with no evidence / backup. But you can get those in my article.